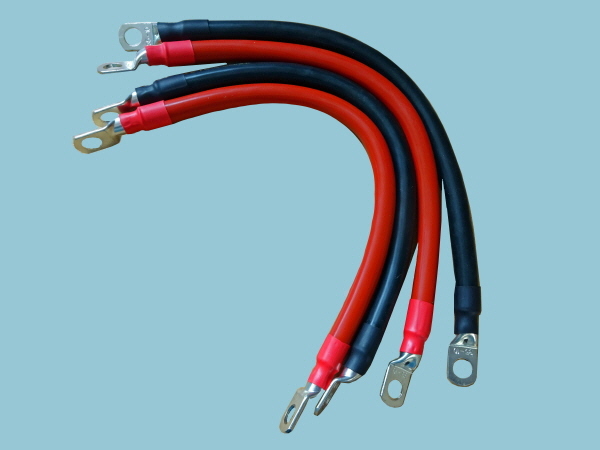 Here you can purchase custom size 60mm² Flexible DC cable with pre-attached lugs, ideal for linking multiple batteries together. Our Flexible DC cable is available in six different cable dimensions (mm²) and cable lengths varying from 200mm to 1200mm with 10mm attached lugs. This product is cut and crimped in house so if you have a specific requirement, just ask and we would be more than happy to give you a quote. Heavy Duty 60mm² Flexible Battery Joining Cables custom made with 10mm lugs.